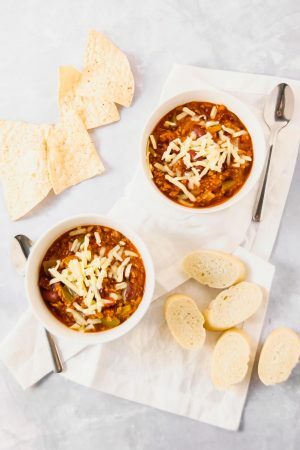 Yummy simple 8-ingredient beef chili made with all the good stuff! Onions, peppers, beef and tomatoes come together with chili powder, oregano and some red chili flakes for some heat on your tongue and all over! OK peeps, I think winter has officially set in here in Montreal. I felt it this weekend when I was up north and saw the snow, drove in icy conditions (dang, gotta get my winter tires on! ), felt the cold in my bones, and last but not least craved delicious, get’s your insides warm, meals. I had a great one the weekend, slow cooker pot roast. It warmed the cottage with a delicious smell and after working outside for a bit it was definitely called for and scrumptious. It even made me realize (even more than I already did) that some sort of slow cooker would be nice to have. But in the mist of all the Instant Pot craze, I’m thinking I want more of a multicooker like the Breville Fast Slow Pro. I’ve seen it in action at my favorite shop, Appetite for Books, during a soup class. I didn’t think my love of soup could get bigger, but with the Fast Slow Pro, I think it did. But for now, back to this simple 8-ingredient beef chili – it’s one for the books and has been a bit of a staple meal my mom makes and now I make because hint: I’ve moved out and now I have to do ALL the adult things. 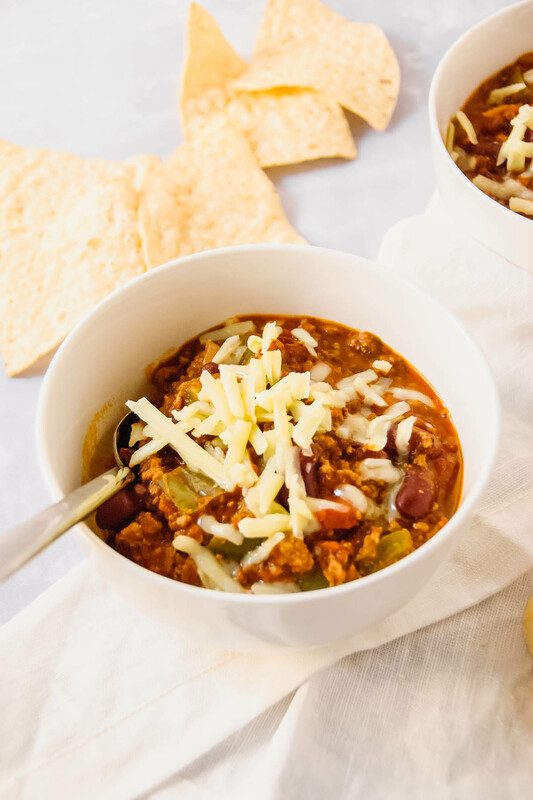 Regardless if you walk in the door from a long day at school/work and the smell of the chili hits your nose you are in for a treat twice over; dinner tonight and lunch tomorrow! Plus it’s almost better as leftovers, the flavors get even more time to meld together. So making chili can be daunting. They sometimes have a ton of ingredients and spices and you’re like I don’t got time for this. Some need to be on the stove top for what seems like forever even before you can actually eat it. Now for some, they think: “hello slow cooker or multi-cooker”, and don’t worry about the never-ending list of ingredients. This chili is different. You can eat it about 45 minutes after you’ve started cooking and you’re only active over the stove for about 15 minutes of that – BLISS! People are late coming home from work, it’s ok! Let that simmer at a low heat for 2 hours if you want – NO BIGGY! Not hungry because you ate a late lunch full of buffalo wings, dip and chips? 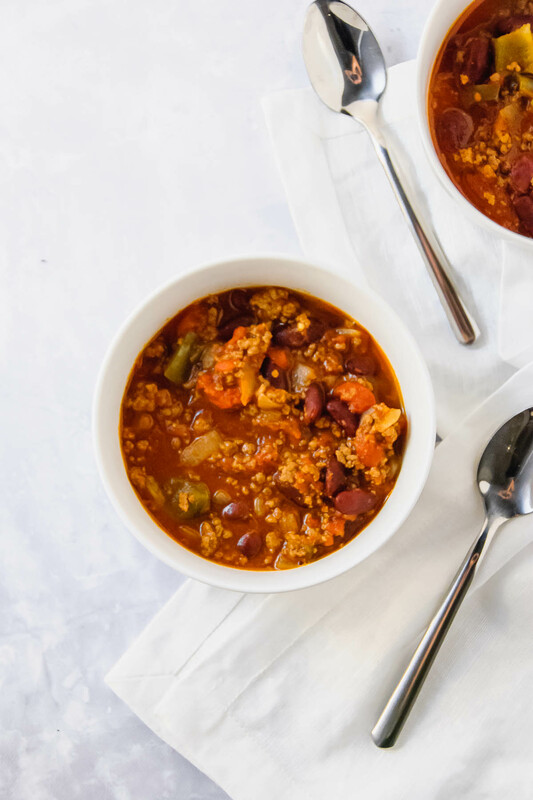 No prob, leftovers for lunch or dinner the next day – YES! Now, I’ve tagged this dairy-free and it is! Just don’t top with cheese! And same goes for those of you who are gluten-free, opt for tortilla chips over baguette – I always do! 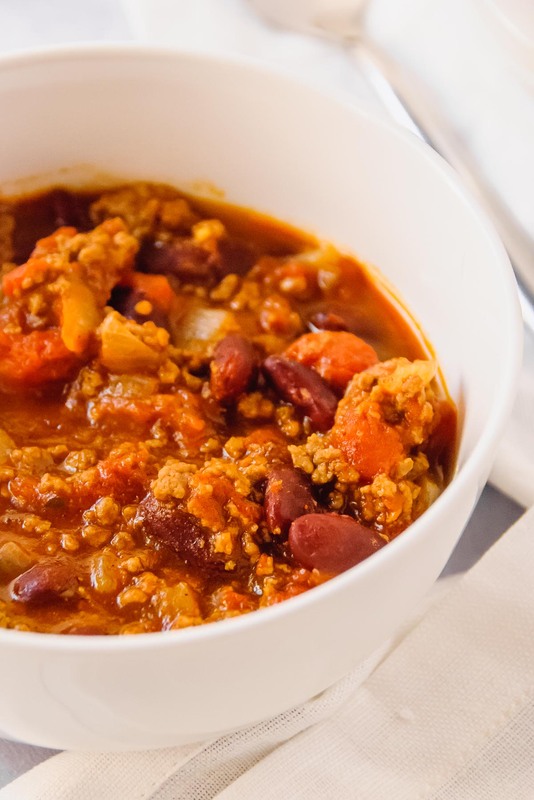 Which leaves me with this: what do you like your chili with? Are you a tortilla chip fan, comme moi? 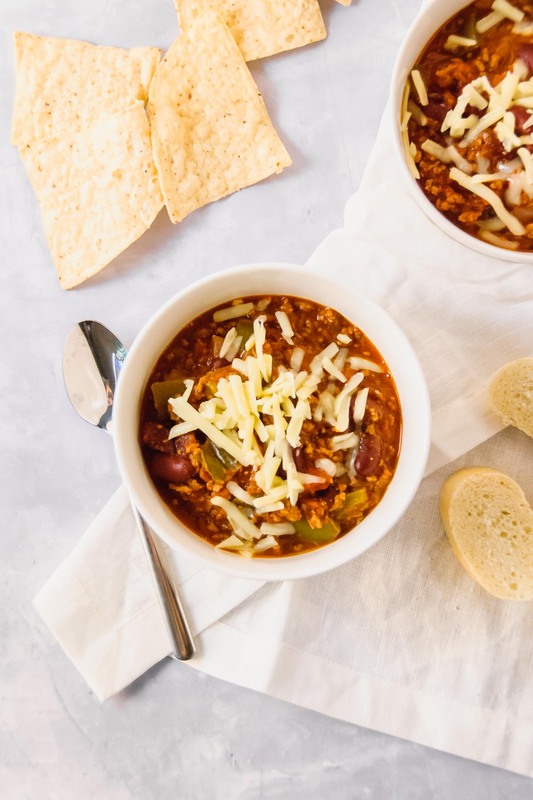 Or to you veer towards slices of baguette with your chili, à la boyfriend? Please help us settle our debate and the fact that we need to have both at or chili table! Grated cheddar cheese tortilla chips and baguette to serve. In a large pot or dutch oven, heat oil over medium heat and sauté the onions and pepper until translucent, about 5 minutes. Add beef and cook until browned, about 5 - 8 minutes. Add the rest of the ingredients and mix thoroughly. Bring to a simmer and reduce to low-medium heat and cook for at least 30 minutes up to 2 hours. 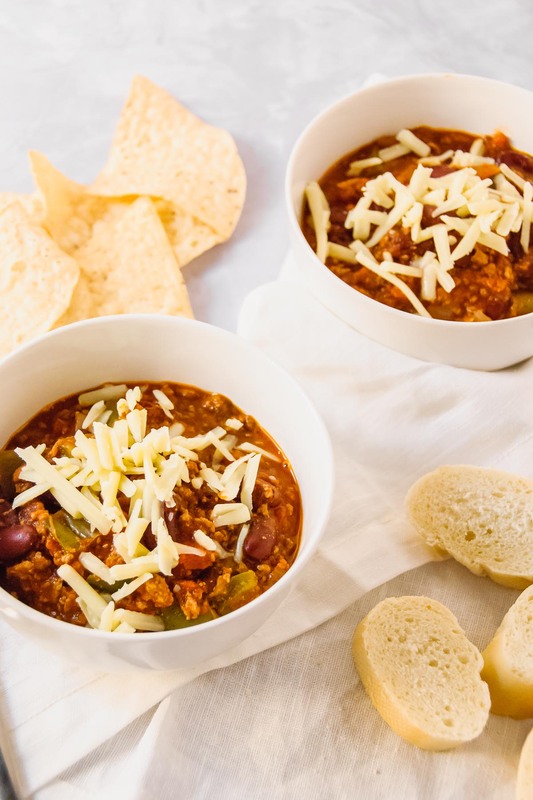 Serve with grated cheese, tortilla chips and baguette. *Choose your favorite! I like vegetable oil or olive oil. 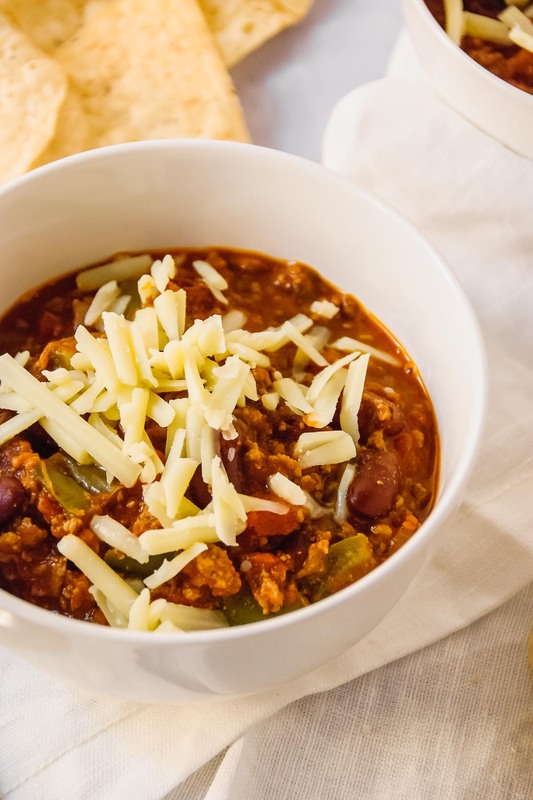 **I choose extra lean in this dish because if not the fat congeals when it is refrigerated (not the end of the world, you can skim it off) and because I like a lighter dish. This dish is great the day you make it and maybe even better as a leftover lunch or dinner; why I have labeled it as cooking for two. Keeps well in an airtight container for 4 to 5 days in the fridge.